Despite the Southern Raillway’s vast electrification schemes from the early years of the 20th. century, steam survived in this part of England into the 1960′s. In this video some of the surviving motive power such as King Arthur, Schools, T9, K and E6 classes are seen being used on railtours of the period. 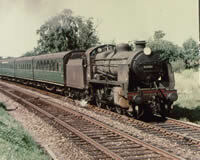 The Allhallows branch was worked by H class 0-4-4 tanks, as was the Hawkhurst line with C class 0-6-0 on pickup freights. Westerham from Dunton Green was also worked by H class, within 20-miles of London Charing Cross. The Bluebell Line closed in 1958. Here are scenes prior to the closure when trains called at Newick & Chailey and West Hoathly. A C2X 0-6-0 traversed the line from East Grinstead in 1959; a year earlier saw the last run of the Brighton Atlantic 32424 “Beachy Head”, all included here. The Rowfant to East Grinstead and Steyning line, Christs Hospital, Ashford and Robertsbridge are also covered. 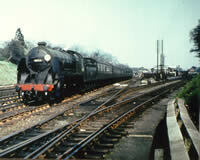 There are Terriers, M7, U and N classes here and the last steam hauled “Golden Arrow” through Tonbridge. This video contains scenes of the steam age on five North Wales branches filmed from 1961 to 1966. 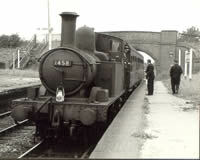 It was the foresight of local railway enthusiast Brian Cowlishaw with his 16mm camera and some Black & White film that we can bring you these memories where not only has steam gone on four of the branches but the tracks as well. The first route covered is that from Chester to Mold, Denbigh and Ruthin and views all the stations from Mold such as Star Crossing, Bodfari, Nannerch and Rhewl. 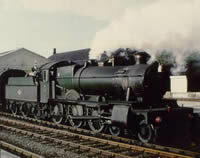 Motive power seen includes ex-LMS 2-6-4 Tanks and Standard Class 4’s. Next we travel lineside from Wrexham Central to Ellesmere (closed in 1962) to view ex-GWR 0-4-2 Tanks Nos.1458 and 1432 on passenger autotrains and 57xx-Class No.3789 on freight pickup duties. Marchwell, Bangor-on-Dee and Overton-on-Dee are seen as the intermediate stations on the line. An in-depth visit to the Brymbo to Minerva line follows the progress of an ex-GWR pannier tank along the steeply graded line over no fewer than eight gated crossings. The line closed in 1972 and our film shows the line in 1965, just as the last GWR 28xx Class were working from Wrexham Croess Newydd shed. The last train to Blaenau Ffestiniog from Bala was filmed in January 1961 in appalling weather, Nevertheless, the rugged atmosphere of this part of Wales is well seen as the two Pannier tanks work the route via Arenig, 1135 feet above sea level. In 1966 steam appeared on a special train on the Conway Valley line to Blaenau Ffestiniog. This was filmed in colour. The special then traversed the Rhyl to Denbigh line hauled by an ex-LMS Crab 2-6-0 No.42942. No modern day material has been used in this one hour production. It is fully soundtracked with an informative but not obtrusive commentary by Brian Cowlishaw who took most of the original film, apart from the last colour sequences, and whose knowledge of the area covered is excellent. The Railways in the Pennines were hard working and often spectacular. In the first of two volumes, this video covers mainly Yorkshire, from Goole in the east to Copy Pit in the West via such interesting places as Leeds, Wakefield, Normanton, Huddersfield and Todmorden. A lengthy excursion down the old Lancashire and Yorkshire route from Huddersfield to Penistone via branches to Clayton, Holmfirth and Meltham are also seen. Snow scenes in the hills above Huddersfield go to show the ruggedness of working steam in the Pennines. In the midst of all this, the recovery of V2 60954 at Mirfield in January 1962 is included. Sixty different steam engines feature from 2-6-4 Tanks through Black 5’s, Jubilees, Crabs, Standards, WD’s and B1’s. Lancashire and Yorkshire 0-6-0 No.52515 creeps in at Lockwood yards with views of Pug No.51218 at Trafford Park. Half of this film was taken by Geoff Lumb who also filmed so much of our “Steam North of Carlisle” video from 1962 to 1968. The remainder of the film was taken by equally competent cameramen to tell the whole story of this area. Well sound-tracked from original recordings and with an informative but not obtrusive commentary, this video continues our coverage of steam around Britain. And, oh yes, the 0-4-0 tank from Huddersfield Gas Works working through the streets is a gem! No modern day material has been used in this video of which 90% is in colour. Cover photo: Geoff Lumb, 42108 & 45565 “Victoria” at Bradford Exchange. York was the headquarters of the North Eastern Region of British Railways and encompassed the lines of the former North Eastern Railway. This video looks at the territory with scenes dating back to 1949 at Thirsk. 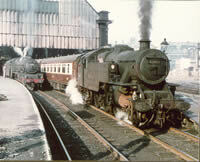 York has a good variety of classes on shed in the early 1960’s from Pacifics to freight locomotives. 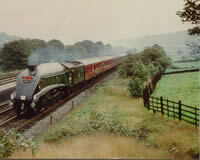 The film follows the route to Whitby and some views near Kippax with Q6 class on coal duty. North from Leeds via Ripon the East Coast Mail Line is reached between Poppleton and Northallerton with scenes at the half-way point of this express route. A visit is made to Darlington Works in 1964. Steaming up the Weardale branch, Consett is reached and a look at the 9F 2-10-0’s working freight from Tyne Dock. Newcastle and Gateshead are visited before going north of the Tyne to see the Reedsmouth branch with the Wansbeck Wanderer railtour of 1963. 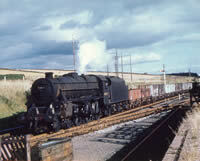 The North Eastern Railway ended at Berwick and steam finished on the region in 1967 around Sunderland and Hartlepool. The freight scene at Tyne Dock, Seaham, Seaton and Ryehope end this always moving visit to the North Eastern Region. 20 different classes of locomotive are included. No modern day material has been used in this production. 94% is in colour, only Thirsk in 1949 is black and white film. It is fully sound-tracked with an informative but not obtrusive commentary. This is the first video of a series portraying the definitive history of the last eighteen months of Steam Traction on the Southern Region. The series will cover events in depth as although it was a sad time, there were many exciting events taking place. Many of these have been told in print before but our cameramen were there to film then and a few events never seen before on video. This first volume covers the first ten weeks of 1966 and 15 different classes are seen in action from the Southern main line to the Somerset and Dorset Joint Railway, the S15 tour with 30837 snow and all to Bordon, the Maunsell mogul to Gosport, Cowes line finale and normal service trains between Waterloo and Weymouth. Each volume in this series will stand on its own as a video but we hope you will want the full set as the years go by. Filmed in colour from snow to sunshine by nine cameramen with a few nice glint views, and superbly sound tracked from original recordings. There is no modern day footage used at all, pure archive. This video looks at the steam scene north of Carlisle and the area covered includes the climb to Beattock summit. 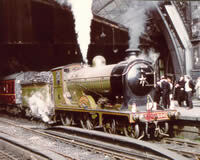 The start is at Carlisle Citadel station and includes a visit to Kingmoor shed for Scot, Clan and B1 classes, for this was a time before the Waverley route closed. Border branches around the city are visited including Silloth, Alston and Langholm before moving on to the Port road to Stranraer viewing Dumfries, Newton Stewart and Kirkcudbright. We move on to Ayr, visiting the shed and their workings to the local collieries in the hands of Crab 2-6-0’s. Also featured are Mauchline, Killoch and Waterside. Along the Ayrshire coast we arrive at Gourrock on our way to the West Coast Main Line approaches to Glasgow Central via Motherwell. All four main routes into Glasgow are seen. Ex-Caley engines still exist with Cowlairs bank echoing to the sound of steam and the preserved Scottish locos are seen touring the system. Besides the usual Stanier and Standard classes, we feature five A4’s, three Duchesses, a WD on passenger duty, an A2 and a Jubilee; a feast of steam in an area never before covered in such length and detail. 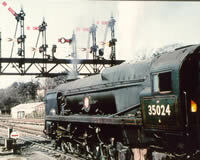 The majority of the film used in this video was taken by Geoff Lumb of Hudderfield who has had many photographs published in railway books and magazines. We have brought it all to life with superb sound and informative commentary. Two minutes of black & white film has been included into what is otherwise a full colour production. Cover photo: Geoff Lumb. No. 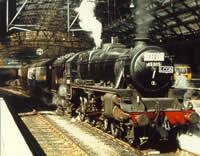 256 “Glen Douglas” at Glasgow St.Enoch. This is a second offering of Douglas Haines 16-mm film following on from his highly successful video of the lines south of Birmingham and the Lickey in Volume 27. We turn our attention to the Fells working north from Birmingham and Uttoxeter to reach the Settle & Carlisle line in the early sixties when Jubilee, Royal Scot, A3 and Clan classes worked alongside Crab, 4F, and 8F over the Pennines. Cumbrian steam includes Maryport, the Keswick branch and early days on the Ravenglass line. Shap Incline was always a good location for engines working hard in superb countryside and the last Duchess workings preclude the more usual sightings of 1967 with long freights banked by the Standard 4′s. As with Volume 27, a tripod was used for steadiness of picture and most views are of sufficient length that one does not feel rushed from one sequence to another. The Southern Railway was the smallest of the “Big Four” but its locomotives could hold their own against anything on the other three and in some cases certainly out-perform them. This video shows them in action from film shot by Jim Oatway in 1961 and 1962 when although Bulleid Pacifics were the main players on the Southern scene, after all there were 140 of them, the last of the Lord Nelsons, King Arthurs and Schools were still at work. We see them on the ex-LSWR route out of Waterloo on weekdays and summer Saturdays, on expresses and Basingstoke semi-fasts. Alongside this action, freight to and from Feltham and Nine Elms yards was worked by Maunsell S15′s, Bulleid Q1′s and the inevitable U and N class Moguls. A visit to Feltham shed shows us in great detail the massive H16, G16 and W class heavy tank locos, not just a glimpse but long detailed views you can appreciate. The rural charm of the Hayling Island Branch and workings on the Isle-of-Wight in 1962 at Ryde lead into never to be repeated scenes of Haywards Heath when the famous “Bluebelle” specials ran with preserved motive power on the main line using locos T9 No.120, Caley Single No.123, “Birch Grove” and the Adams Radial No.488. Cine film of the steam railway was well into its stride by 1968 when hundreds of photographers were recording the dying days of steam traction on British Railways. We are fortunate in that we have access to thousands of feet of film taken of these events and needed only to use the best from cameramen who had already been filming for years and had therefore got the “hang” of it by 1968, thereby producing some excellent footage. This is a definitive look at the happenings and events of these last seven months from January 1st. with all remaining steam sheds visited at least once surrounded by normal steam workings of the time as they come to an end, culminating in the 4th and 11th of August specials. Highlights of the last workings are Chequerbent and Padiham branch freights, Windermere branch, the last steam workings to Liverpool and Blackpool, the last steam derailment (48666 at Rose Grove! ), the last Copy Pit banker disposed and all the notable specials of the year. All in all a balanced look at the last days of steam in glorious colour and sound.